Your shoreline is a valuable part of your waterfront property. In addition to adding visual appeal, it provides a vibrant habitat for wildlife and fish and improves the structural integrity of the water’s edge. Extensive shoreline erosion can affect entire ecosystems, water quality, and make your property lose its aesthetic charm. With the help of a marine contractor, you can prevent erosion and give your shoreline a new lease of life. Here are three techniques to help you stabilize your shorelines. Consider installing nature-based features such as vegetation and oyster reefs on bare or moderately eroded shores. Vegetation not only beautifies a shoreline but also adds a terrestrial buffer that protects against erosion by minimizing the impact of waves on your shoreline. When building a living shoreline, do your best to mimic nature. Living shorelines can help to restore habitats that support wildlife and fish along the beachfront. Techniques for natural shoreline stabilization include using vegetation only and using vegetation with edging structures or building sills. Go for vegetation-only solutions in areas with low-energy waves. In regions with low- to medium-energy waves, choose edging techniques that utilize vegetation and additional structures such as oyster reefs, rock gabions or geotextile tubes to control erosion. Alternatively, install sills parallel to a living shoreline to strengthen the existing vegetation. Natural shoreline stabilization minimizes wave energy, encourages tidal exchange, supports habitat connectivity, and improves access to your waterfront. Ask your local marine contractor to recommend native plants and materials that are appropriate for your site’s condition and salinity levels. High-energy waves can increase the risk of wave damage, flooding, and extensive shoreline erosion. Consider structural or hard stabilization techniques such as beach nourishment, breakwaters, and groins to prevent erosion without damaging existing habitats. Try beach nourishment to widen your beach land. This method entails adding large volumes of sand to an eroding beach, which helps to move the shoreline further into the sea. Use beach nourishment plus vegetation for additional anchoring and protection from flooding and high-energy waves. Alternatively, use offshore structures to slow down waves, minimize the impact of wave action, and improve sediment accumulation. Breakwater structures can be attached to the shore, left to float, or affixed to the ocean floor. Leave gaps in between the structures to encourage tidal exchange and habitat connectivity. Go with groins if you are looking to retain the sand following a beach nourishment routine. This technique entails placing metal sheet piles, timber, or concrete at a perpendicular angle to the shore. The structures interrupt sand and water flowing parallel to the shoreline to break waves and protect the beach from erosion. Make your shorelines more resilient by using both structural and natural stabilization methods. Hybrid techniques include the use of bulkheads, geotextile fabrics, poly-mesh, filter socks, coconut fiber logs, and bio-logs among others. Work with your marine contractor to understand what hybrid stabilization methods would benefit your shoreline. Hybrid techniques are recommended if you want to create a rigid shoreline, protect the base of the shoreline — which is more prone to erosion — and shield the slope of the bank. Bear in mind that with mixed stabilization methods, it can take a while before your shoreline is adequately protected because the vegetation needs to grow. The whole process can take up to three years. Consider factors such as the cost, the time it takes for the vegetation to establish, and other requirements such as bank shaping when deciding the suitability of hybrid methods for shoreline stabilization. 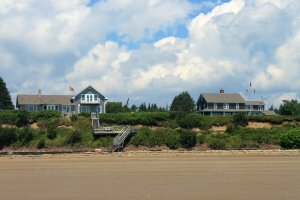 Whether you are planning to build a home along the coast or you have an existing waterfront property, a marine construction expert can help you bolster your shorelines and protect beachfront land and structures. Call Abbotts’ Construction for expert advice on shoreline stabilization options available for your situation and professional marine construction services.